BRIGADOON DELUXE LETTER-BOX EDITION laserdisc movie. COMMENTS: [from Wikipedia] Brigadoon is a musical by Alan Jay Lerner and Frederick Loewe, first produced in 1947. It tells the story of a mysterious village in Scotland, which appears for only one day every hundred years. Far from being a curse, the enchantment is viewed by the villagers as a blessing. According to their covenant with God, no one from Brigadoon may ever leave the village, or the enchantment will be broken and Brigadoon and all its inhabitants will disappear into the mist forever. Two American tourists, lost in the Highlands, stumble upon the village just as a wedding is about to be celebrated, and their arrival has serious implications for the village's inhabitants. Lerner's story was based on a much older German story by Friedrich Gerstäcker about the mythical, German village of Germelshausen that fell under an evil, magic curse. In 1947, memories of the second World War were too fresh to present a German-themed musical on Broadway, so Lerner reimagined the story in Scotland, complete with kilts, bonnie lassies, bagpipes, Highland flings and "Heather on the Hill". Lerner's name for his imaginary locale was probably based on a well-known Scottish landmark, the Brig o' Doon (Bridge of Doon), in Alloway, Scotland, in the heart of Robert Burns country. According to Burns' poem Tam o'Shanter, this 13th century stone bridge is where the legendary Tam o' Shanter fled on his horse Meg in order to escape from three witches who were chasing him. "Brig" is a common Lowland Scots word, meaning "bridge". It occurs in several English versions of Scottish placenames, e.g. "Brig O' Turk". Other sources suggest that "Brigadoon" was constructed from the Gaelic words: briga which means "strife" or "hill", and dùn which means "hill, hill fort, or hill village." The name may also be a reference to the Celtic Goddess Brigid, as in "Brigid's Hill." Yeah the story idea for Brigadoom did come about from the original movie. The premise is a place that you stumble onto that is out of time and in a different place than you normally would see. The original movie was actually a famous play first and then made into a film, the Lexx episode just sort of 'appropriated' the idea just a bit. I did not find "briga" in my Gaelic dictionaries, so I have no idea where they've got that idea from. Even trying to accomodate for possible spelling errors didn't help turn anything up*. A reverse search for "hill" and "strife" didn't result in anything that was even remotely close. Too bad they didn't say what their sources are. Dùn is indeed a fortress or fortification, as in Dùn Èideann = Edinburgh. * The phonetically closest word I could find is briogais = pants. No kidding! While getting some background on Kai's past and the Brunnen-G culture was nice, this episode isn't one of my favourites: the singing is often just slightly out of tune. However, I thoroughly enjoyed the Lexx writers throwing in a musical; rather daring, and funny. And I always enjoy the fight song - terribly. What I actually liked best was the dawning realisation that the ensemble performing the same musical again and again, for all eternity, is a mere repetition of their earlier insular behaviour. The Brunnen-G tend to get stuck in time, it would appear. 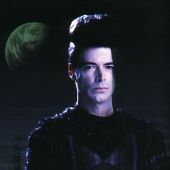 Hello Karen and welcome to Lexxverse..now if I remember correctly Kai's marking was a map to his home, Brunnis2, a way for the romantic warrior to find his way back..also if you want more Lexx music the best way to find it, since Maya has logged it all on the http://www.michael-mcmanus.com site..look for the Kai-pod and listen to your heart's content.. Since I am a piano player and some pieces of this episode sounded familiar to me, I think I finally can help out with three more songs. "Go beyond" must base on "Hänschen Klein (ging allein). For sure they did some transposing to this, but I am quite sure "Hänshcen klein" was the template for it. The two love songs "Farewell" and "Two hearts" could be from "Weißt Du wie viel Sternlein stehen". Iam not 100% sure thus the original is a bit different in some tunes, but accordingly to the transposal and lots of accordances (hope this is the right term for it) to the german original. And the last I could find out was "Brunnen G" (We are the Brunnen G...). This definatley comes from "Ein Männlein steht im Walde". There are as well some transposals in it, but this is it for sure. I hope you still wanted to find this things out an are happy about his answers. I probably can manage to write down some of the notes when I listen to the music, try playing it on the piano and then write it up. But it isn't that easy because there are voices on it and I can't hear every tone from the piano. But it could be possible accordingly to have the original piano themes of ther german songs. Who the hell did find out that they used german children songs??? This fact was really a hepl for my why so many songs sounded so familiar. Maby I can manage to write down notes for the rish "Vaiyo A-O" if I get the sound file. But that is really hard stuff since they never show him completely playing all tones on the piano. I would be interested in your versions of the songs for Brigadoom, Warpax. And thanks for explaining some of the original songs. My background is in singing, not piano, so I would love to work out the harmonies for the parts the ensemble are singing. Brigadoom is one of my favourites episode, if not my favourite. I've always been a fan of musicals, and I've always found they communicate the story and the emotions in an incredibly direct way, straight to my brain. Brigadoom certainly did this. And it has given me plenty of music to ponder for weeks after. I loved seeing a glimpse of the living Kai. Do you think he was 'alive' while he was on stage? I mean do you think he could feel and think as he did when he was alive? His smile when Xev asks if this was how things really were seems to suggest to me he did. If so, then that makes his choice to leave the theatre and go with Stan and Xev to fight Mantrid even braver. As for the music, I really enjoyed this. I was initially worried about Kai singing, as often singing voices are different to speaking voices and I didn't want it to ruin my memories of Kai's gorgeous speaking voice. Anyway, I was pleasantly surprised how well both he and Xev could sing, even if they weren't up to the level of the ensemble singers. I enjoyed the tunes, and I thought they were beautifully performed by the ensemble and even the cheesy stuff was done well. My favourite song has to be "We are the Brunnen G". I love the way the major and minor verses reflect the points of view of Kai and the older Brunnen G.
A question - is the voice of His Shadow in Brigadoom the same as in I Worship His Shadow? I don't think it is, and I wondered if it was the same actor who played Dr Longbore, but I'm not sure. Another question - were the actors actually Brunnen G? Or were they some other race/species who were playing Brunnen G for that performance? And if they perform this show over and over again, was this just a special occasion where they happened to have the real Kai to fill in the role for a change? Or do they do different shows all the time? Probably not questions that really have answers, but they're just my musings for the moment. Oh, and one other questions, I seem to recall reading something about the fight song where they overdubbed Michael's voice over it, but I can't find a version that sounds like he's singing it anywhere. Does anyone know of one? Not sure now if I didn't just make that up. But I think the first on went out quite well. To your last question, I think I can remeber him singing direct in season 1.1. when he and his comrades face the Foreshadow. I think he was singing there. Yes, the voice of the shadow in both Episode 1.1 and Brigadoom is the actor who does Dr. Longbore. The only one that's not the same actor is the very very first shadow that killed living Kai after he crashes into to foreshadow. I can't remember if the shadow's voice from the chess game is also the same, I'll have to go watch it again. And the Brunnen G Fight Song that is used in the opening credits of every episode and in Brigadoom is not Michael's voice. Warpax is very correct that the only time we actually hear him singing it is as he and his comrades attack the foreshadow. Y'know what though. My very favorite instance of Kai truly singing was in "The Trip", the episode where Xev and Stan eat the berries from Lyekka and have all the hallucinations. It was just wonderful that Kai sang songs from Brigadoom to that flower thingy that sparkled because it liked his voice. I almost cried, it was so sweet. To answer the question of Kai leaving the theater, perhaps he saw it as simply trading one form of living death for another? When you look at the interaction between the Newborns and the 'elders', the Newborns saw how their elders lived as a living death. The elders were simply existing and the culture was to put it bluntly, stagnant. Kai being a Newborn at his death would have held the same views as his peers. Squish - I just checked out 'trip' and you're right, I had forgotten Kai sang something from Brigadoom for that. Very nice! I has assumed if was Yo Way Yo again. As much as I like Yo Way Yo I did find it a little annoying that it was almost the only song Kai seemed to sing - lost a little impact for me in the final episode because of this sadly.